Generally, when we travel we try to find the most economical way to arrive at our destination. That usually means booking our own air rather letting a travel agent or tour operator do it. We made an exception to that rule recently after signing up for a cruise leaving from Fort Lauderdale, Florida. 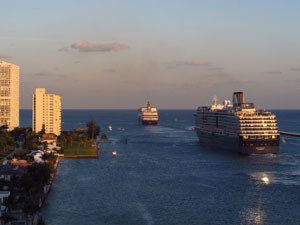 When sailing from an East coast port, many people arrive the night before—a good plan since air travel can be uncertain, and the change from Central or Pacific time doesn’t allow for delays. But this time we decided to try flying in the day of departure. Knowing that choice could be risky, we opted to book our air through the cruise line—a hedge against unexpected problems. Princess Cruises has a new program that is more flexible for choosing flights than previously, with costs only slightly above tickets found on consolidators. That’s a program we were thankful for when we learned upon arrival at the Austin Airport that our original flight had just been canceled. Instead of arriving in Fort Lauderdale at 2:30 p.m. for a 5:00 p.m. sailing, we were booked on an alternate flight scheduled to arrive at 4:30. Even if it was on time, we still had to claim our luggage and get from the airport to the dock (a 20 minute taxi ride), check in, and board the ship before departure time. All during the flight we were mentally formulating alternate plans to get to Antigua, our first port, in case we missed the ship. But here’s how it played out: A strong tailwind pushed us along in the air, so that the plane arrived 25 minutes early—a stroke of luck. I called Princess immediately when the plane was on the ground, and they assured us a representative was waiting at baggage claim and a bus would transport us quickly to the dock where check in would be expedited. Because the cruise line facilitated the process, we stepped onto the ship just before 5:00. Had we missed the ship, the insurance we purchased would have covered expenses such as a hotel in Fort Lauderdale and flight to Antigua, but we would have traded two relaxing sea days for a hectic race to the island. As it turned out, that wasn’t necessary, but it reaffirmed why we always buy trip insurance. The best scenario, as with home or auto insurance, is to never need it—but we believe it’s important to have it just in case. (I’ve only had to make a claim once, for a camera that was stolen in Africa, and the insurance completely covered costs of camera, battery, and photo card). As the saying goes, all’s well that ends well. We had a fabulous 10-day cruise in the Eastern Caribbean, with stops at six islands. But we’ll continue to plan for unforeseen situations that can happen any time you travel.